Place pancake mix in a bowl. In another bowl, whisk eggs, milk, chocolate syrup and oil. Stir into pancake mix just until combined. Stir in pecans. Bake in a preheated round Belgian waffle iron according to manufacturer’s directions until golden brown. Meanwhile, in a small bowl, beat chocolate butter ingredients until smooth. Serve with waffles. Freeze option: Cool waffles on wire racks. Freeze between layers of waxed paper in a resealable plastic freezer bag. 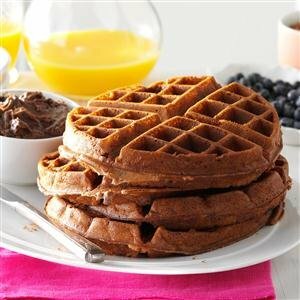 Reheat waffles in a toaster on medium setting. Or, microwave each waffle on high for 30-60 seconds or until heated through. Makes 4 round waffles.